The dry desert wind whistled past us, giving the Ear of The Wind credence to it’s name. The kids had already scaled the dune, shouting empty echoes into the Ear and I followed their tiny footprints in the sand. The only footprints. There was no one else around. The steep surrounding canyon walls concealed every noise like a jealous lover. And the valley felt completely desolate. A desert landscape exhibition just for us. Of course we couldn’t leave the US without visiting Monument Valley. It was on the must-visit list when we were in Utah a couple weeks prior, but then we decided that our TMS RV trip would be the perfect time to do it. As with most destinations we intend to visit, I navigated straight to Viator to see what type of tours were available in the area. And that’s when I discovered the Lower Monument Valley Safari. A tour going behind the scenes at Monument Valley with a real local native Navajo guide. Culture and sight-seeing in one tour… perfect! Monument Valley is about 60 miles west of the Utah-New Mexico border, straddling the border of Arizona and Utah. 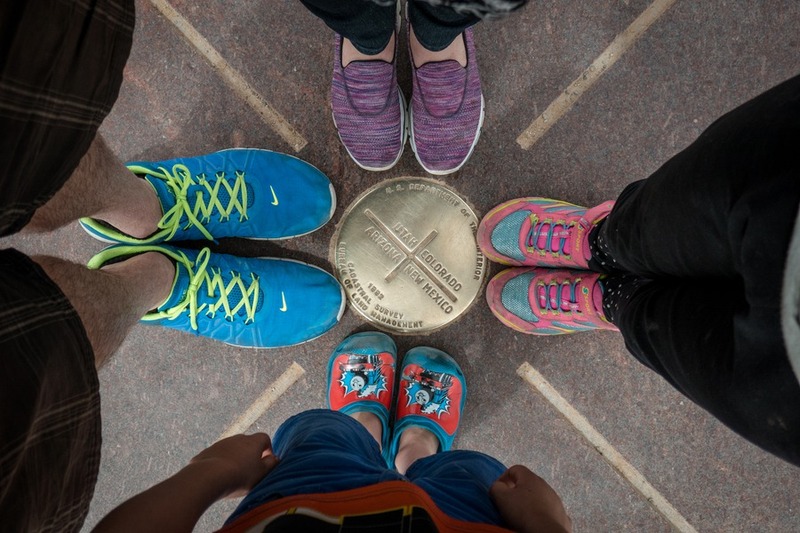 Nearby is the Four Corners Monument, which is also worth a look while you’re in the area. We drove from Hurricane, Utah (near Zion National Park) all the way to Monument Valley in one day, going via Page, Arizona with a quick stop at the breathtaking Horseshoe Bend. Entrance to the park is $20 per car for up to 4 people, with each additional visitor $6. Kids 6 and under are free, but the person manning the booth was not very forthcoming with that information and we ended up paying extra for Caius. So please double-check before you pay. As this is a Navajo Nation Park, the annual National Parks pass (which we love) isn’t valid here. Inside the park is only one set of accommodation: The View. Appropriately named since the views are incredible. 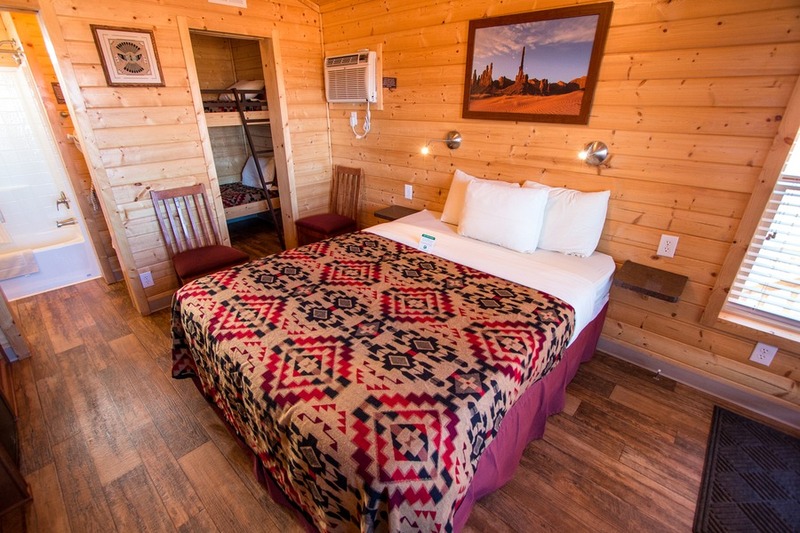 Other than The View the nearest accommodation is Kayenta, which is located 20 miles south. 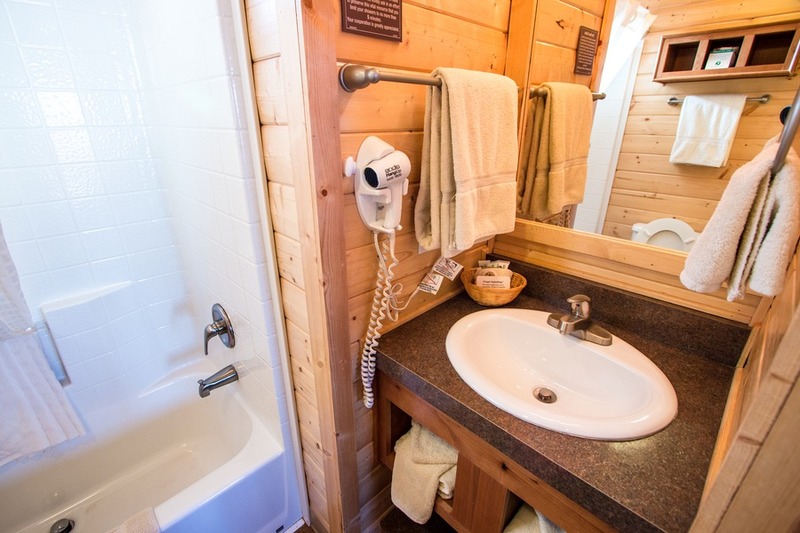 We stayed in a premium cabin at The View since our tour was to leave at 8am the next morning. And as promised, it looked over the entire valley where we witnessed a spectacular sunset and an even more astonishing sunrise. 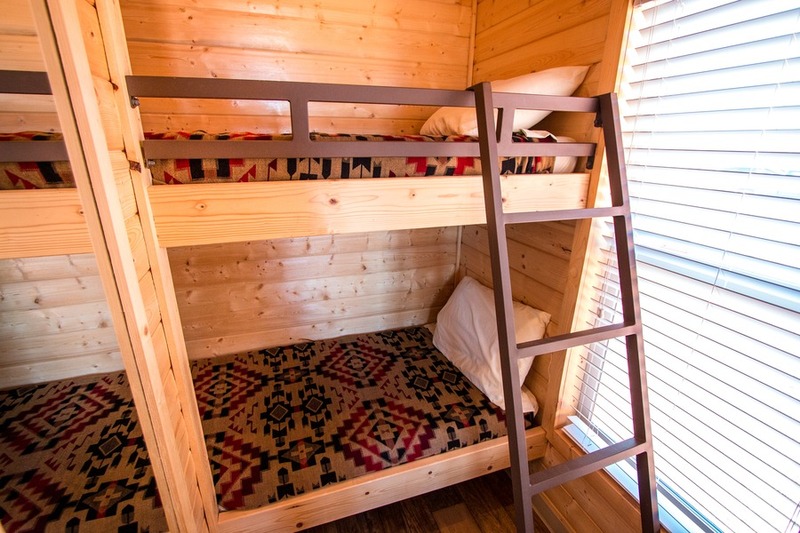 The cabin featured one large bedroom, bathroom and a small room with one set of bunks. After a few days in our camper, the shower was a highlight. But you have to be conservative since some of the Navajo tribes still don’t have access to running water. You can drive through Monument Valley by yourself (although no RVs allowed). 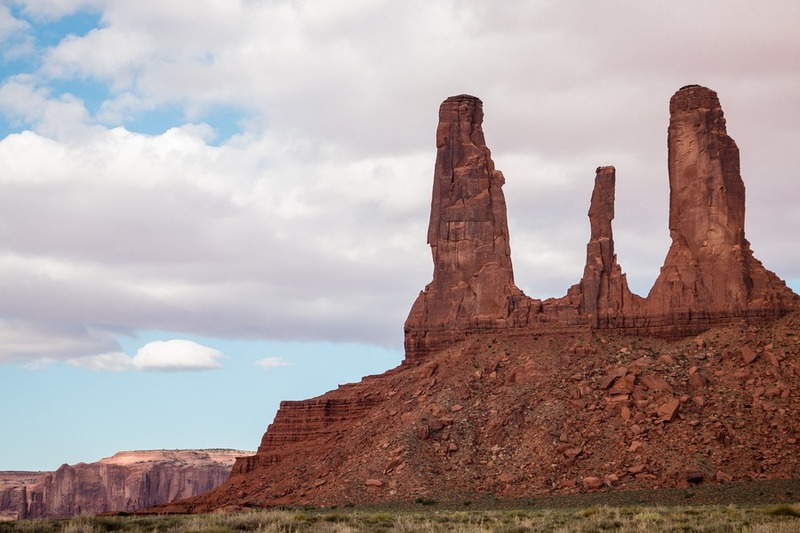 A 14-mile dirt road will show you a handful of the valley’s movie-famous locations – The Mittens, Three Sisters, John Ford’s Point and Totem Pole. But there is so much more to the Colorado Plateau than this. 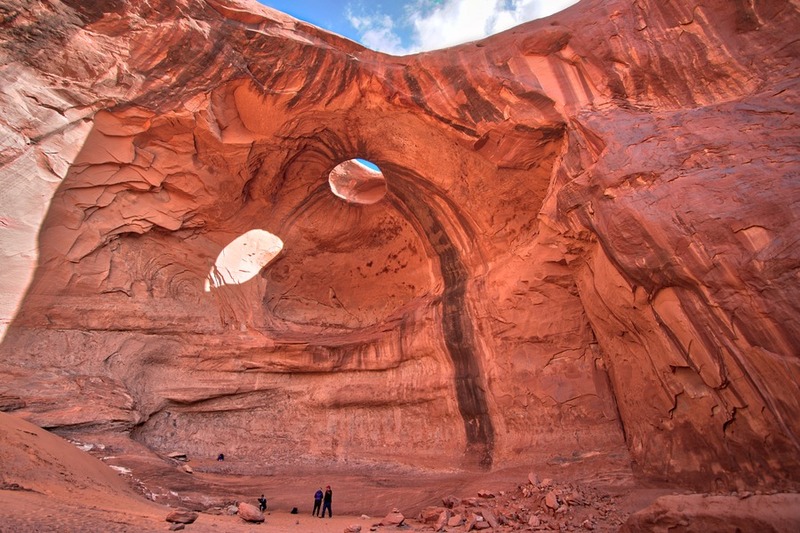 Vast sandstone buttes conceal deeper mysteries than what’s on offer to the public. Roads and trails only accessible by the Navajo. No free-wheeling tourists allowed. Our tour started at the lobby of The View at 8am. We were greeted very casually by our Navajo guide, Duffy, almost as if he wasn’t there to do a job, but was meeting friends. I was slightly unsettled at first, but quickly became accustomed to the casual and informal style. As we were the only tourists on this particular trip he took us outside to his waiting open-air truck and we started the drive. The early morning sky was covered by patchy clouds and there was barely a whisper of wind to break the quiet chill. We rugged up as best we could do in our jackets. The cool temperature was in such contrast to the dry, desert landscape. Even as the climbing sun beat down on the red dusty countryside, we kept our jackets zipped up tight. Initially we stopped at most of the popular tourist spots: the world’s largest Elephant Butte (joke intended), the Three Sisters, Big Chief Monument and Sleeping Dragon Rock. 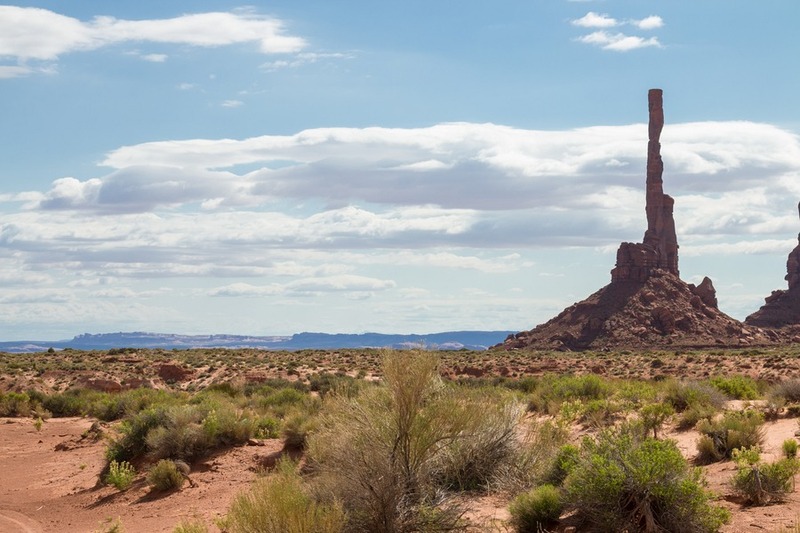 We spent time taking multiple shots at John Ford’s Point before our guide finally went off-road into the deserted rugged landscape of the real Monument Valley. As we passed by some of the valley’s oldest Anasazi ruins, it felt like we were the only ones left in the world. Over the next two hours our tour included stops at the Ear of the Wind arch, a walk inside the Big Hogan and a visit to a traditional Navajo home called a “hogan”. The Navajo clad their hogans with dirt. At first glance it looks like a giant anthill with a door in the side, much like a hobbit’s home without the grass. Inside we met the granddaughter of the owner proudly sharing her rich family history and hand-made crafts. After we had visited a number of off-road sites, our guide took us on an exciting sand dune ride through the back of the valley. We navigated deep into side-box canyons before making our way over a shallow muddy/river crossing, before spitting back out onto the more familiar road-worthy dusty trail. It felt like a much more authentic experience being shown around by a Navajo tribal member. He was full of information about his ancestors and culture, and was very patient with our many questions. Sure you could see Monument Valley by yourself, but you don’t want to. It’s full of so much more than just what can be seen on the public road. Although the landscape looks the same as it did 300 years ago, or even 3,000 years ago, the secret stories of this sacred valley can only be revealed when you venture in deeper with a local guide. wow....awesome place. that is hidden beauty of Mexico. all photos are looking great. you captured beauty of this place and night view is awesome. One of my favourite places we visited on our USA road trip! I have always wanted to take the Navajo guided tours in Monument Valley. Did you go to Mystery Valley? 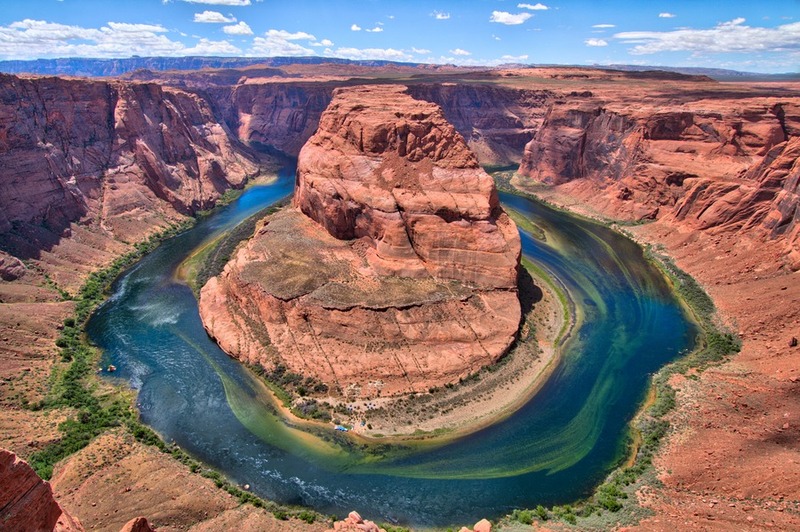 It's Horseshoe bend, way further than monument valley.